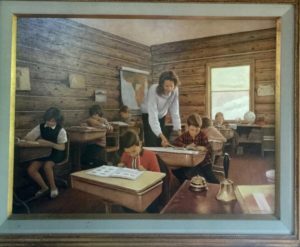 On a land and sea trip to Alaska, my husband and I had the honor of visiting a homestead family. Jonelle, one of the daughters, met us at the hotel, rode on the bus with us, and told us the family story. 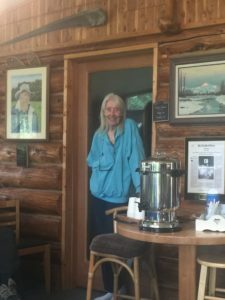 In the 1960’s, when she was three years old, her mom and dad, who rented farmland in South Dakota, decided they were never going to get anywhere there, and heard about a program in Alaska where they could homestead 160 acres. They loaded their four small children, two dogs, chickens, and a cow, and headed to Alaska. The Porterfields’s couldn’t get to their land, or transport their animals until the river froze over. It took them over a year to get from South Dakota to their land in Trapper Creek, AK. Geographic for her Alaskan school. JoAnne, who is now in her 80’s, still takes care of her house, yard, and garden. She lost her husband ten years ago, and continues forward with the dream she and her husband built together. Today, she has chickens, goats, ducks, and a beautiful garden. When she moved to Alaska, she leaned to cut meat off a slab of moose hanging in an outside shed , to live in one room with her family so they might all stay warm, to save every nickel because she knew they could not earn a nickel. 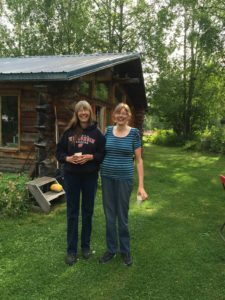 Her daughter Ardis, who was in a car wreck in her early 20’s, stayed in Alaska, and had two children, visits her mother regularly, and made oatmeal cookies for our visit. She loved her life and living the simple, sustainable life her parents chose. Jonelle told us she does anything she needs to do to earn a living. She works at the local pizza place, helps her son Levi who lives close and is involved politically and socially in the community, and, of course, helps her mother. These three women, one mother and her two daughters, are rural women extraordinaire. They are strong, inclusively kind, and work hard every day. Their connection to each other was touching, and they each shined on their own merits. They loved the simple life, and the challenges of living with nature. It was their heart, so to speak, and they were very proud to share their joys, compassions, and values. It was the highlight of my visit to Alaska. They touched my rural women passion. I was envious and nostalgic. I am honored to give them recognition. I often watch some Alaska programs, and the life is hard (I know something about that, I left for a regular paycheck) but the values and priorities that they live their lives by always comes through. Although I’m not interested in working that hard just to exist, I do appreciate those who live a simpler life if a life without convience can be called simple, maybe it is just the opposite, maybe I have the simple life and they have to be aware that the wrong move or choice can be life or death. Thanks for the story Jennifer. ps I want to hear from a sled dog too, one that really really loves to run, maybe the lead dog??? Harold, many really do work hard to just survive. I loved our visit with this family. An inspirational example about family and connection and hope for something better.